Good News, Medical Coders. You’re In High Demand! After a couple years of delays, October 1, 2015 marked the U.S. rollout of ICD-10, the 10th revision of the International Statistical Classification of Diseases and Related Health Problems list by the World Health Organization. This rollout, in conjunction with several other economic and societal factors, has put talent in the healthcare information industry in very high demand. In this post, let’s take a look at several of the factors contributing to this high demand for medical coders. We’ll also provide a couple of tips on how to leverage this opportunity. When looking at all occupations and industries related to healthcare, growth is projected to be 10.8% between 2012 and 2022, making this category the nation’s leading growth sector. 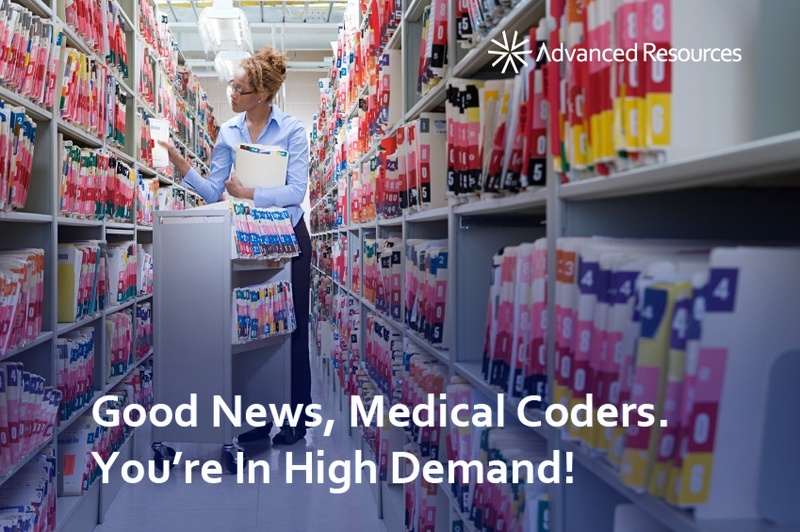 When broken down a bit further, the Bureau of Labor Statistics predicts that the medical records and health information technicians field (including medical coders), is expected to grow 22% in the same time frame! 1) Unemployment is down across the board. This August the unemployment rate fell to 5.1%, the lowest it has been in seven years. And currently, according to a recent article on Healthcareitnews.com, the unemployment rate for medical coders is under 5%. 2) Healthcare as a whole is in a unique position in terms of job creation and wages. Baby boomers are retiring in droves while the need for healthcare services is increasing. People are living longer, baby boomers require more health services, and the Affordable Care Act has increased access to health services for millions of Americans. This has increased demand for all healthcare positions, including medical coders. 3) Updates to technology, information systems, and codes require very specific skills to ease transitions. Insurance companies, hospitals, and billing firms are all in need of talent that has a sound grasp on new technology and new codes, both for completing their functional role and to train other team members. How Can You Leverage This Opportunity? 1) Stay aware of competitive salaries. As demand increases, salary trends should follow. It is important to understand the salary trends in your geographic location as compensation can vary greatly. 2) Work with a staffing agency that specializes in Healthcare. They will help you explore your options and they have established relationships with the organizations that need your talent. Whether it is a hospital that requires help in making the transition to ICD-10 or it is an insurance company looking for an ICD-10 trainer, staffing agencies help organizations fill these roles. 3) Keep learning. As information, systems, and technology evolve, you’ll need to remain competitive. Keep your skills sharp through continuing education, industry news, and learning about industry trends. It is a great time to be a medical coder and it appears the growth will continue. Make sure you are aware of all your options in this talent-driven market! Are you a medical coder? Contact us for your next career opportunity!